A moderately strong climber; stem cluster forming, without sheath bright yellow in colour, 1.5 cm in diameter. Leaves ecirrate; leafsheath with prominent knee and flagellum, light green to yellowish green in colour, densely armed with non-seriate, stiff, bulbous-based spines; leaflets ensiform, alternate, acuminate, to 50 cm long, 2 - 2.5 cm broad at middle, ciliate at apices, bristly on upper and lower nerves; petiole armed with straigth, subulate spines; rachis with conspicuous bulbous based curved spines. Inflorescence flagelliform, 3 m or more long; axial part of inflorescence digitately clawed at intervals; male partial inflorescences to 150 cm long; primary bract armed with 1 cm long straight spines; male rachillae 8 - 10 cm long, attached above the mouth of the respective basal bracts; female partial inflorescences attached high above the mouth of the respective basal bracts; each 25 - 30 cm long; involucrophorum in female rachilla outside its own bract, distinctly pedicelliform; involucre discoid, almost flat; female flowers in 2 series, 5 mm long, each pointed upward. Fruit ovoid, tapering at base, 20 - 25 mm x 18 mm; fruit scales swollen outside, shining, pale yellow, with deep channel at middle, arranged in 21 longitudinal series; endosperm ruminate; embryo basal. In moist forests of the Western Ghats mostly at 600-2000 m. Common in the Nilgiri Hills. Infrequent in the moist deciduous forests of Dhoni hills, Palghat at 275 m.
A moderately robust climber; stem solitary ? or cluster-forming, to 8 m long, with leafsheath 3.5 cm in diameter, without sheath 2.5 cm in diameter. Leaves ecirrate, to 2 m long; leafsheath pale green, with distinct knee, sparingly spiny; spines 1 cm long, with bulbous base; ocrea absent; leafsheath flagellum to 6 cm long; petiole to 55 cm long, armed with 5 mm long spines; leaflets pale green, regularly disposed on rachis, narrowly lanceolate, acuminate, 45 cm x 2 cm; nerves with 2 cm long ciliae on both surface. Inflorescence flagelliform. Male and female inflorescences superficially similar, 3.5 m long; each with 4-5, about 20 cm long, once branched, partial inflorescences; rachillae to 6 cm long; subtending bracts cylindrical at base and expanded upper to form a 1.5 cm long cup. Male flowers about 8 mm long. Female flowers 4 mm long; staminodes 6, ovary 3-locular; ovule solitary in each locule: stigma recurved. Fruit globose, 1.8 m in diameter, shortly beaked, falsely pedicellate; fruit scales green to yellowish green, shinning, deeply channelled at middle. Solitary, high climbing canes. Stems with sheaths to 3 cm in diameter, without sheaths to 1.2 cm. Sheath pale green, densely armed with spines to 1 cm long-, knee conspicuous. 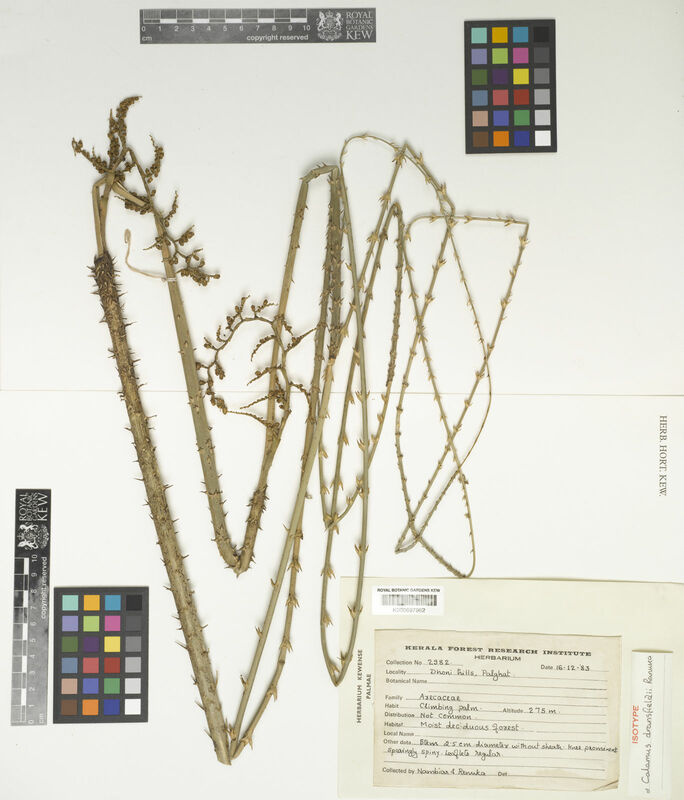 Leaf ecirrate, to 2.5 m long including the petiole; petiole to 30 cm long, biconvex, armed with small prickles, underneath with recurved spines; rachis triangular, underneath with recurved spines, petiole and rachis when cut exudes milky latex; leaflets ca 50 x 2.5 cm, terminal pair united basally, shiny green, underneath with shallow linear pits when fresh, 3- veined, veins ciliate on the upper half, lateral veins ciliate above, midvein ciliate beneath, cilia upto 1 cm long. Inflorescence long, pendulous; primary sheath tightly sheathing, two-keeled, tip lacerate, spiny; partial inflorescence to 18 cm long; secondary sheath unarmed , tubular, tightly sheathing; rachillae to 5 cm long, arched and recurved, arising from just above the mouth of the sheath; involucrophorum stalked, to 3 mm long, attached above the mouth of the sheath; involucre disc shaped. Fruit globose. Scales in 26 rows, deeply channeled along the middle, yellow, shiny, bright green when young. Endosperm ruminate. Evergreen forests at about 530 m. Mangalore Forest Division and Sampaje (Fig. 5). Clustering, high climbing canes. 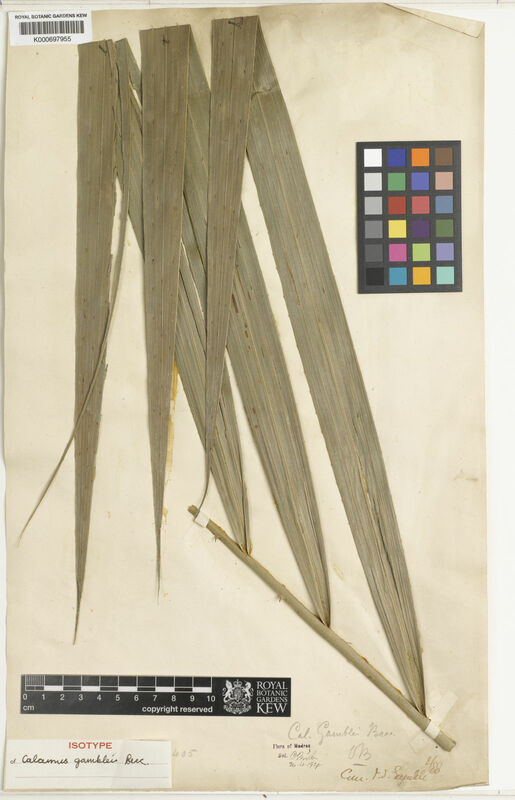 Stems to 15 m or more in length, very thin at the base, ca 0.5 to 0.8 cm in diameter, getting thicker upwards, distally with sheaths to 3.5 cm in diameter, without sheaths to 1.5 cm, basal nodes producing new shoots. Sheath green in the basal portions and greyish green distally, sparingly spiny, spines to 0.5 cm long, bulbous at base; knee very conspicuous, unarmed. Leaf to 2 m long, ecirrate; petiole ca 30-40 cm long, biconvex, armed with small spines; rachis with recurved spines on the under surface, when cut exudes milky latex; leaflets ca 65 x 2.8 cm, gradually becoming smaller towards the tip, the terminal pair ca 20 x 1.2 cm, slightly united at the base, regular.linear-lanceolate, ciliated at tip, 3-veined, midvein ciliated above on the upper half of leaflets, lateral veins ciliate below on the upper half. Inflorescence long, flagellate, flagella often getting modified into suckers; primary sheath tightly sheathing, spiny; partial inflorescence to 15 cm long;secondary sheaths tubular, inflated at the mouth; rachillae to 5 cm long, arched and recurved, the upper ones gradually diminishing to 1 cm long; involucrophorum stalked, conspicuously callous at its axilla next to the axis, involucre disc shaped; fruiting perianth pedicellate. Fruits 2x2 cm, globose, scales in 19 rows, deeply channeled in the middle, yellow with brown border, shiny. Endosperm ruminate. Flowering November -December. Fruiting May-June. Evergreen forests at about 950 m., usually seen near water course. Behaves like a runner. Agumbe state forests, Samse, Koppa. (Fig 4). The glossy yellow cane is largely used for making furniture. A good quality cane, used in furniture industry. Calamus shendurunii Anto, Renuka & Sreek.